Live edge furniture like the Amish Frontier Table with Live Edge can go modern or rustic, which adds to its appeal. This solid wood table features a natural live edge top and a thick and gorgeous cross beam trestle base. Live edge wood features the natural edge of the wood that comes from right beneath the bark. What do you envision for your dining room? 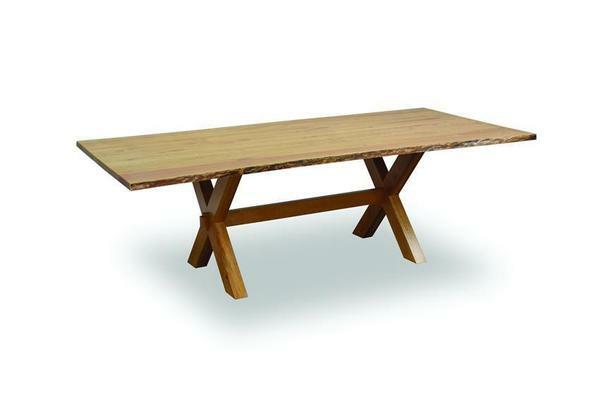 We'd love to chat with you to best match you with the right dining table. Email or call today to connect with a knowledgeable Furniture Specialist. Thank you for shopping DutchCrafters for your dining room.